Deals not only with McCarthyism but the whole repressive trend characterizing American life and urges resisting every outreach of tyranny, as the early Quakers did. James E. Bristol (1912-1992) was an international Peace Worker who started as a Lutheran Minister at the Grace Lutheran Church in Camden New Jersey. While serving there, he spent eighteen months in jail because of his conscientious objection to military service. After his release, he spent forty years on the board of the Central Committee of Conscientious Objectors. Because of this experience, people called him the granddaddy of the C. O. movement. Throughout his life, he followed his own conscience in the face of the imperatives of the government. 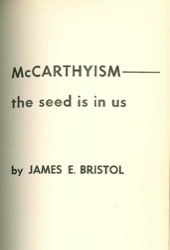 He addressed this theme in his Pendle Hill pamphlets, which addressed the relationship between Friends testimonies and McCarthyism. Between 1947 and 1977 he worked on the staff of the AFSC, running the Quaker information Center in Calcutta, India. In that position, he planned Martin Luther King Junior’s 1959 trip to India. He later took a staff position with the AFSC in Zambia. After retirement in 1977 he took two years off before returning to the AFSC to work with their Community Peace Education Program. He worked on the AFSC program on Youth Militarism and the Draft and with the National Council to Repeal the Draft. He also directed their Southern Africa program during the late seventies and early eighties.